A compleat map of North-Carolina from an actual survey / by Capt’n Collet, Governor of Fort Johnston ; engraved by I. Bayly. 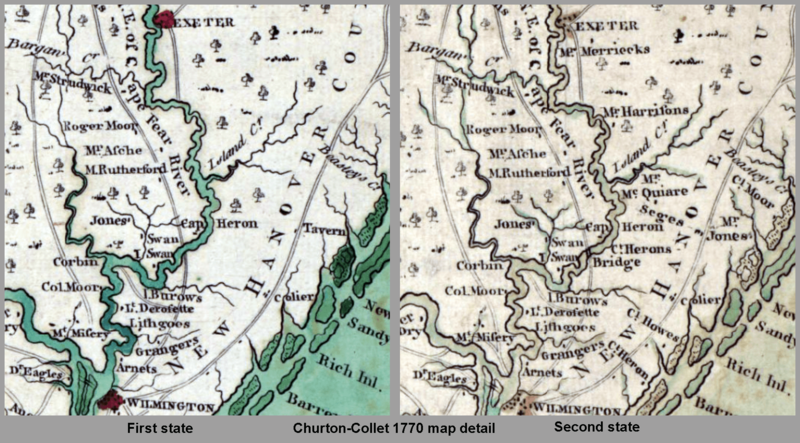 However, examination of the two copies held by the Library of Congress reveals that there are (at least) two separate states of the map. The first state lacks several place names and other features found on the second state. 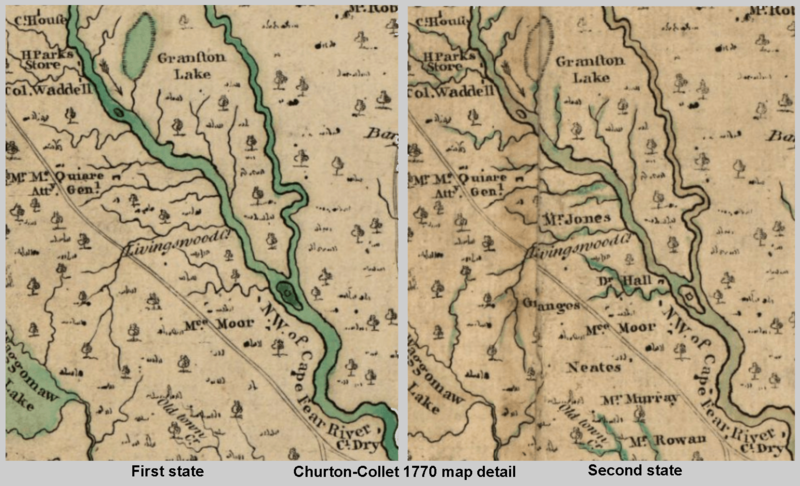 Some of the obvious additions to the engraved plate for the second state of the map are illustrated below. Not illustrated: a large stippled area N of Bath, “landscaping” in Col. Palmer’s tract E of Bath, and the naming of Linvile Cr. in the SW part of Wachovia or Dobbs Parish. 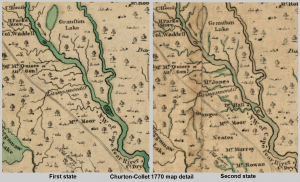 Many kind people at the following institutions have assisted in tabulating this survey of Churton-Collet maps: The British Library, Boston Public Library, South Caroliniana Library, MESDA, North Carolina Collection at UNC-Chapel Hill, Yale, Harvard, Clements Library, Newberry Library, University of Virginia, and State Archives in Raleigh. Obviously, these kind folks went out of their way to help, and the assistance they provided is greatly appreciated. Examples from other institutions are either available on line or in books or auction catalogs. Unfortunately, the UK National Archives in Kew was unwilling to assist in identifying the states of the 2 copies in their possession, and no published images of those two examples have yet been located. La Bibliothèque nationale de France catalog suggests that they have a 2nd copy, but this has not been confirmed and only one copy in their possession has been digitized. Do you know of any other state(s) of this map? Have you located a copy not included in the census? Please let us know via the “What’s on your mind” comment box below. 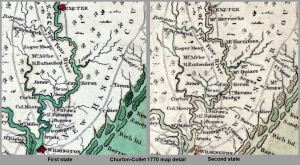 This entry was posted in 18th Century, Cartobibliography and tagged John Abraham Collet, John Bayly, John Collet, Re-stating, Samuel Hooper, William Churton by crmaps. Bookmark the permalink. May 2015 – updated census to include a 4th known copy of the first state, this one in the collection of the Moravian Archives in Herrnhut, Germany. Their catalog indicates the presence of two copies of the map, but only the one for which an image is available is included in the census above. July 2015 – a recent visit to Moravian Archives in Herrnhut, Germany, by Larry Tise provided confirmation that their 2nd copy is in the 2nd state. That information has now been added to the census. January 2016 – the copy in the Hargrett Library at the University of Georgia has been added to the census (2nd state). November 2016 – the copy in the MacLean Collection has been added to the census (2nd state). February 2017 – the copy in the possession of Barry Lawrence Ruderman (1st state) has been added to the census.